Our morning Gospel reading this morning stands in contrast to our Old Testament lesson. In our first reading, we heard about a Shunamite woman who, out of the goodness of her heart, shows hospitality to Elisha. Not only did she feed and give him lodging, she adds a guest room on to her house so he can stay in comfort… Contrast this to the story of Mary and Martha. 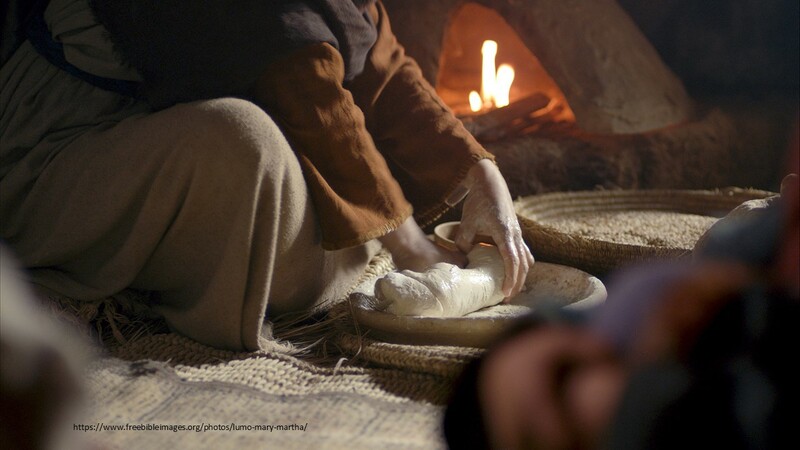 During a visit by Jesus, Mary sits at his feet while Martha spends the afternoon in the kitchen. Martha isn’t happy with the arrangements and asks Jesus to order her sister to help. Do you remember Jesus’ response? The woman in the Old Testament reading was rewarded for her hospitality, in the New Testament reading Martha, who tries to be hospitable, is critiqued. What’s up with that? Let’s check it out. 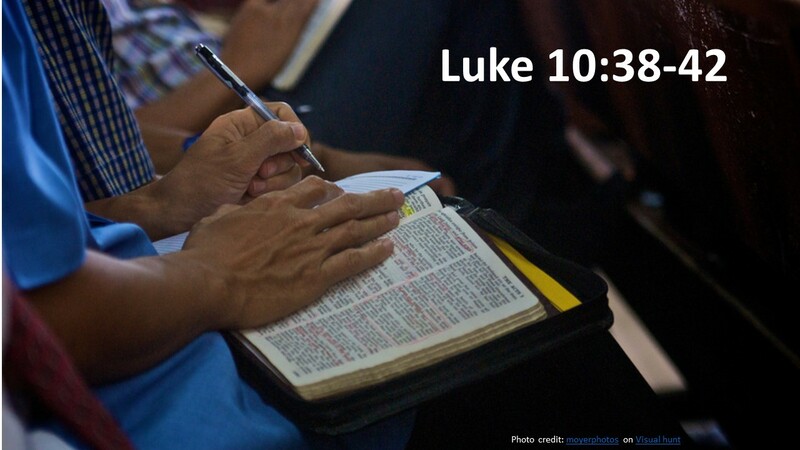 Read Luke 10:38-42. A recent article in Fortune Magazine, reporting on the 2019 World Happiness Report, claims the United States is the unhappiest it’s even been. I don’t believe that statement is quite right. I’m pretty sure they weren’t conducting such research at the height of the Civil War or Great Depression, but the article points out we’ve been dropping in the happy list for the past several years. We’re still in the top quarter of the pack, but we’re not doing as well as we once did. By the way, we don’t want to be at the bottom of this list, which is populated with war-torn regions like the South Sudan, Central African Republic, Afghanistan, Yemen and Syria… We’re way ahead of them, which isn’t hard to achieve. But ahead of us are all the Scandinavian Countries, many European Countries along with Canada, Australia, New Zealand, and Costa Rica. 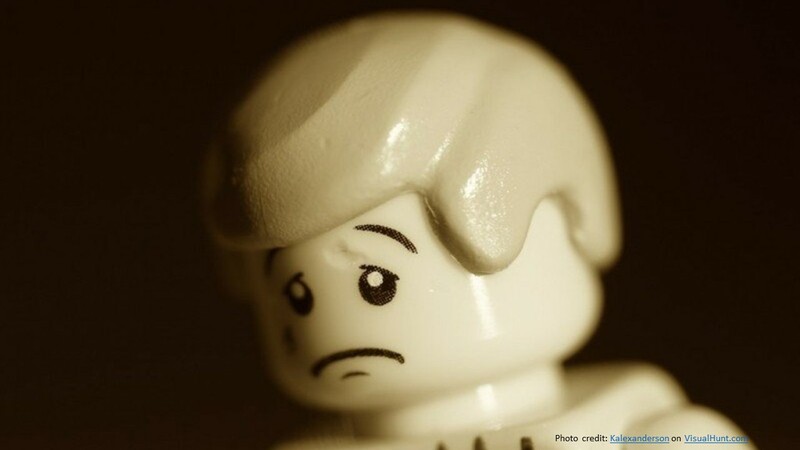 While prosperity is rising, we’re less happy. As the old cliché goes, money can’t buy happiness. But there are many other factors playing into this study. One of the study’s co-authors noted that the United States is a “mass-addiction society.” This isn’t just addictions to drugs and alcohol, which I think we would all agree brings unhappiness. But there’s a host of other addictions: “gambling, social media use, video gaming, shopping, consuming unhealthy foods, exercising, engaging in extreme sports, and risky sexual behaviors.” All of these create problems for happiness. Addiction is on the rise. Let that sink in for a minute. Arthur Brooks, one of this year’s Calvin January Series speakers, had a new book come out this month. I read the first half of it this past week. It’s titled, Love Your Enemies: How Decent People Can Save America from the Culture of Contempt. I highly recommend it. Brooks’ points out that anger isn’t our problem. What he sees as a problem is contempt. When we are angry, we are generally wanting something better. When we hold someone in contempt, we are essentially wishing they didn’t exist. In a chapter titled “The Culture of Contempt,” he suggests that much of America, even though we hate it, are addicted—there’s that word again—to political contempt. We don’t like what this contempt does to us (not to mention those we disagree with), but we can’t seem to get enough of it. Like a junkie, we “indulge” in the habit. And the media, who has economic interest in our addiction, is more than happy to feed us. How do we break this cycle? How do we realign ourselves? How do we get back in line with what it means to be an American? To be a Christian? To be a follower of Jesus? 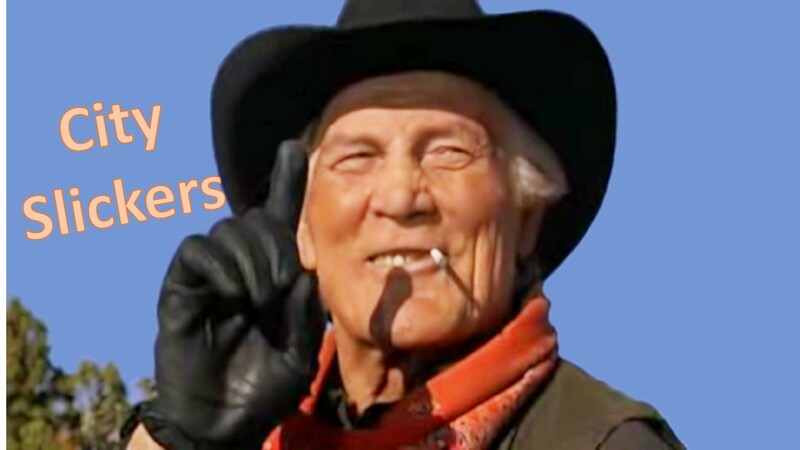 Do any of you remember the old movie, City Slickers? It doesn’t seem to be old, but the movie was released in 1991. It starred Billy Crystal who, with a group of his friends from the city, decide to go out west for a few weeks to help round up cattle. In one scene, Crystal is riding on a horse beside Curly, an old fashion cowboy who could have been the Marlboro Man. When Crystals asks about his secret to being content in life, Curly points his index finger and says it’s this. Crystal is confused and asks, “You’re finger?” Curly shakes his head and replies it’s just one thing. Of course, Curly isn’t able to tell Crystal what’s his one thing is, that’s for him to find out. This “one thing” is now known as Curly’s law. 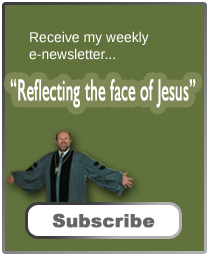 I suggest that the one thing Jesus points out to Martha was himself. Serving others is good, doing a good deed such as feeding visitors is commendable, but there is a deeper human need and if we don’t ground ourselves there, we burn out. As humans, we have a need to connect with others and as a Christian, our need includes a connection to Jesus. How do we go about this? Let’s see what our text says. Our morning text comes on the heels of the Good Samaritan. In that encounter, Jesus tells a teacher of the law, who was having a hard time understanding what Jesus was saying, a story. The message: be like the Good Samaritan, and “go and do likewise.” As with our Old Testament story, we get the idea that we’re to be about serving others. 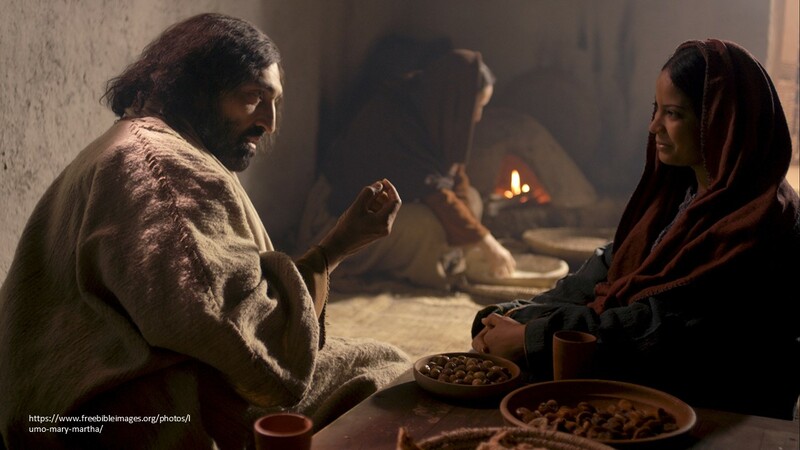 Now Jesus encounters a woman, Martha, who is so busy serving others that she can’t understand Jesus’ teachings. Jesus offers her an example, her sister. Martha needs to “sit down, listen and learn.” Are we to be about serving? Or listening? Or both? Jesus isn’t telling Martha to be inhospitable. Hospitality is an important trait of Christians. We are told in the book of Hebrews: “Do not neglect to show hospitality to strangers, for in doing so some have entertained angels without even knowing it.” We are supposed to welcome the stranger, after all we have the example of the Good Samaritan. In his parable on the last judgment, Jesus tells us that we will be judged by how we react and treat those who are poor, hungry, naked, sick, or in prison. Hospitality is important; it’s imperative for us Christians to be courteous and gracious, warm and generous. But it’s not the only thing. Let’s look at the story. Jesus is traveling and stops at Martha’s home. This passage shows us a radical side of Jesus. Ignoring all the common customs of the first century, Jesus stops in the home of a woman, who is there with her sister, and even offers the women an opportunity to sit at his feet as a disciple and listen to his teachings… This would have been a scandal in the first century. Mary takes Jesus up on his offer. She sits down and listens to what he has to say. Martha, as the host, has work to do. We can assume she’s preparing some kind of fancy dinner… As the afternoon progresses, Mary became more and more intent on listening to the saving words of Jesus while Martha became more and more disturbed that she had to make all the dinner preparations. Finally, Martha has enough. Here, she is fixing a nice sit-down dinner, and while she’s working, her sister enjoys Jesus’ company. Perhaps, Martha’s a little envious… She tries to get Jesus on her side by appealing to his compassion. “Lord, doesn’t it bother you that I’ve had to do all the work?” she asks. Reading between the lines, we get the idea she really wants to say, “Tell Ms. Couch Potato to get in here and help…” Do you sense the contempt is rising in Martha? Jesus is moved by Martha’s plea. He responds, repeating her name twice. I imagine he speaks softly, slowly and tenderly, “Martha, Martha.” With the right inflection, it would be like saying, “Calm down, Martha, its okay.” Then he goes on, telling her she’s worried and distracted about so many things when there was need of only one thing… Remember Curly, riding high in the saddle, and saying there’s just one thing. Actually, both interpretations may be right. This is not an either/or situation. It’s a both/and situation. Certainly Jesus never denied the importance of eating… He feeds the 5000 and centers our remembrance of him at a meal around a dinner table we call communion. It’s important for Mary and Martha and Jesus to eat. Jesus never denies this. Yet, he is concerned over Martha’s fretting over how long the turkey has to cook. You see, as long as Martha is whipping up potatoes, she’s not able to visit. A simple meal is sufficient. A simple meal would allow them time to talk and enjoy each other’s company. With a simple meal, Martha still could be hospitable and also have a chance to sit at Jesus’ feet and learn. Are we like Martha? 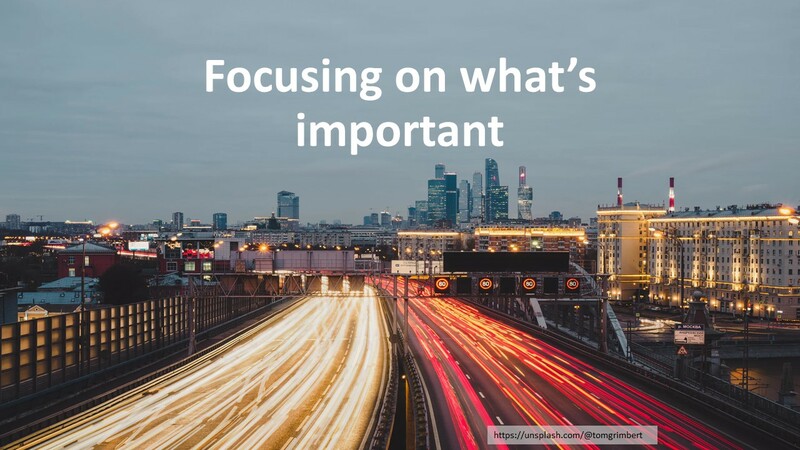 Do we worry and become distracted over so many things that we are unable to see what’s truly important? Do we keep our lives so busy that we have no real quality time to spend with friends? (I’m guilty). If so, we just might be missing something important… After all, Martha missed a chance to spend time listening to our Lord’s teachings. Don’t forget about hospitality, but remember that it’s not the only thing. You know, this is a busy time here at Skidaway Island Presbyterian Church. The Session has begun working on a strategic plan for the future. A small group of Elders have spent a lot of time on this project. This week, the rest of the Elders will join in the process, and then we’ll be asking for your help and ideas. 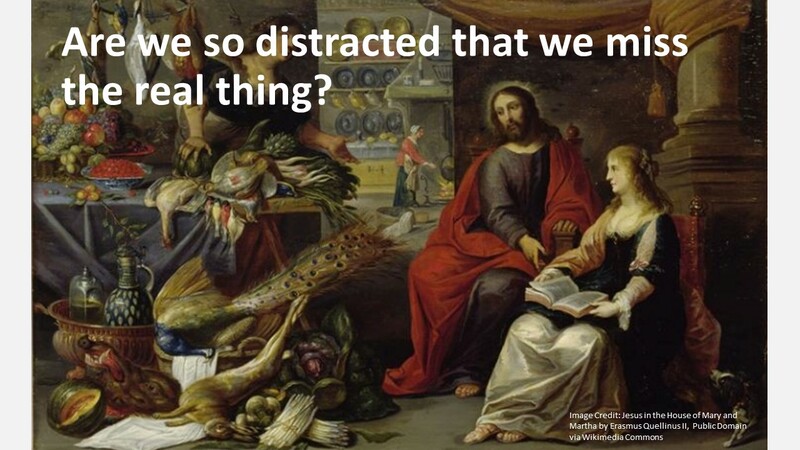 This is good and needed work, but I encourage us to not be distracted from that which we truly need… Jesus Christ. Without Jesus, what we do will mean nothing. He’s our reason for being, for he calls us together in communion with him. 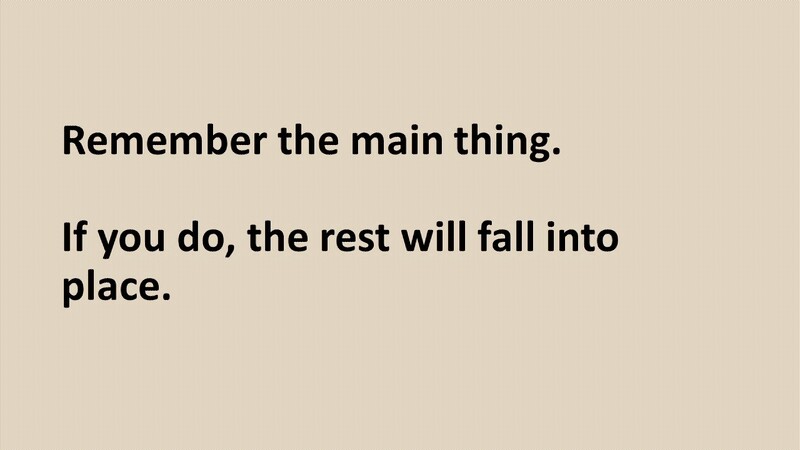 So remember the main thing. Make sure to take time to spend with Jesus, daily. If you do, the rest will fall into place. Amen. 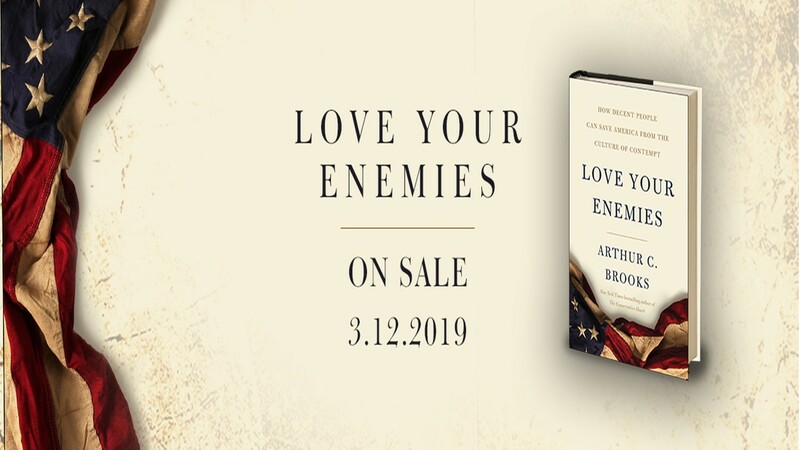 Arthur C. Brooks, Love Your Enemies: How Decent People Can Save America from the Culture of Contempt (American Enterprise Institute, 2019), 28-29. Fred Craddock, Luke (Louisville: John Knox Press, 1990), 151-152. The Feeding of the 5000 and the Institution of the Lord’s Supper can be found in all four gospels. 5000: Matthew 14:13ff, Mark 5:30ff, Luke 7:10ff and John 6. Lord’s Supper: Matthew 26:26ff, Mark 14:22ff, Luke 22:15ff and John 13:21ff. When I travel, it’s striking how unhealthy our country is. It’s a sad thing and one I don’t see improving. We let ourselves be driven by our addictions. That said, do have a peaceful new week. I agree that there’s a lot of unhappiness in our country. It’s the fast-paced life, having too much to do, and trying to meet the expectations of achieving great things, whether it’s in school, work, or relationships. So few people are truly happy. We need to slow down, simplify, and not keep comparing ourselves to others. Good reminder of where we should have our focus and attention. I think if we have our priorities in line and face life with the right perspective–meaning with our faith in God and our focus on Jesus and his teachings–that we will find our own versions of peace and happiness.